Holabird Western Americana Collections is on the cusp of presenting its first big auction of the New Year – a two-day affair slated for the weekend of Jan. 20-21, featuring nearly 1,500 lots in many collecting categories, online and in Reno, Nev. 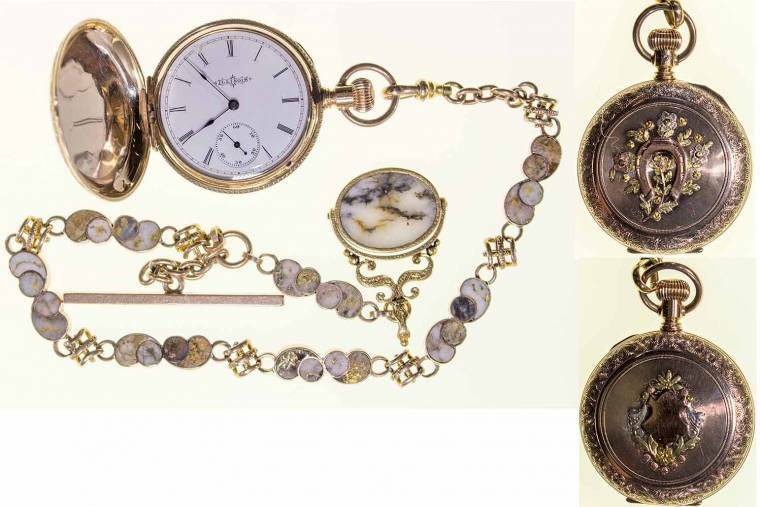 Choice pocket watch with gold-in-quartz chain made in 1899 by Illinois Watch Co.
RENO, Nev. - Jan. 10, 2018 - PRLog -- Holabird Western Americana Collections, LLC is on the cusp of presenting its first big auction of the New Year – a two-day affair slated for the weekend of January 20th and 21st, featuring nearly 1,500 lots in many collecting categories. The auction will be held online and in Holabird's gallery, at 3555 Airway Drive in Reno, starting at 8 am Pacific time both days. Online bidding will be provided by the platforms iCollector.com, Invaluable.com, eBay Live and Auctionzip.com. Phone and absentee bids will also be accepted. A virtual catalog of the sale in its entirety, showing all lots, is up and online. Viewers can "flip" through each page and do keyword searches, too. They can also register and bid with a click of a button. The Saturday, January 20th session will showcase mining and minerals, art, foreign items, Native Americana and general Americana. The Sunday, January 21st auction will feature cowboy, firearms and weaponry, militaria, gaming and tokens, numismatics (coins), tokens, bottles, saloon, railroadiana, Wells Fargo, World's Fair and Expositions, bargains and dealer specials. Nearly half of all lots on Day 1, January 20th (377 of the 723 lots being offered) are general Americana. One item is a strong candidate for top lot of the auction overall. It's a choice pocket watch with a gold-in-quartz chain, made by the Illinois Watch Company in 1899 (by then its corporate offices had moved to San Francisco), engraved to John J. Kelly (est. $6,500-$10,000). From the same category will come a rare silver chalice made in the 1870s or 1880s in historic Virginia City, Nevada and stamped on the bottom by the maker (M. M. Frederick), 6 ½ inches tall (est. $2,000-$5,000); and a one-sheet original poster from the 1940 Western movie Triple Justice, starring George O'Brien and Vivian Vale, 27 inches by 41 inches (est. $500-$1,000). A star of the mining category is a 1908 stock certificate for the Great Cariboo Gold Company of British, Columbia in Canada, in the amount of 84 shares, issued to Annie E. Price (1833-1910), possibly Benjamin Price's daughter from the U.K. (est. $500-$1,000). The 15 inch by 13 ¾ inch certificate is signed by J. Houghton as president and shows eight gorgeous gold nugget vignettes. Minerals will feature a Triassic reptile fossil discovered embedded into black shale in Guizhou, China and measuring 6 inches by 11 inches (est. $600-$1,000). The 200 million-year-old reptile, known as Keichousaurus hui, was first discovered as a species in 1958, and has only been found in China. It was a "prey species" dinosaur, meaning it became food for a lot of other creatures. Native Americana will be led by a beautiful white buckskin Pow Wow dress, with orange, green, yellow and black beads and fringing on both sides. The Northern Plains dress should hammer for $1,200-$3,000. A choice foreign lot is the set of four intricate hand puppets, made by the noted puppet "maestro" Katherina Bekleshova of Russia, probably in the 1940s (est. $2,000-$4,000). The politically-themed puppets are about two feet each in length and are in excellent condition. Numismatics will showcase a pair of three-coin commemorative coin sets honoring Israeli leader and 1994 Nobel Peace Prize winner Yitzhak Rabin, being sold as one lot. Each set consists of two silver coins and one gold coin of 22 carats (16.96 grams). The coin was designed by Aharon Shevo, with Rabin's portrait engraved by Tidhar Dagan. The lot is estimated at $2,000-$6,000. Paper currency will be highlighted by a scarce 1882 Watkins red-on-blue $10 advertising note, made famous more recently as a Ford car promotion in 2008. The original note was made in Laramie, Wyoming which, in 1882, was essentially the center of northern cowboy country. The note – advertising "Dry Goods, Groceries, Hats, Caps, Boots, Shoes" – should hit $1,500-$3,000. Fans of gaming collectibles won't be disappointed. Nearly 20 lots will come up for bid, led by a War Eagle 25-cent slot machine from around the 1930s, all-original, with the original wood sides and base. The machine, one of the classic "one-armed bandits" and still popular with collectors, has had a professional repainting and appears to be working, but has no key (est. $1,500-$3,000).